Internet of Things (IoT), enterprises and data-driven organizations must become adept at efficiently deriving insights from their data. In this environment, any time spent building and managing infrastructure rather than working on applications is a lost opportunity. That’s why today we are excited to introduce Google Cloud Bigtable — a fully managed, high-performance, extremely scalable NoSQL database service accessible through the industry-standard, open-source Apache HBase API. Under the hood, this new service is powered by Bigtable, the same database that drives nearly all of Google’s largest applications. Cloud Bigtable excels at large ingestion, analytics, and data-heavy serving workloads. It's ideal for enterprises and data-driven organizations that need to handle huge volumes of data, including businesses in the financial services, AdTech, energy, biomedical, and telecommunications industries. Unmatched Performance: Single-digit millisecond latency and over 2X the performance per dollar of unmanaged NoSQL alternatives. Open Source Interface: Because Cloud Bigtable is accessed through the HBase API, it is natively integrated with much of the existing big data and Hadoop ecosystem and supports Google’s big data products. Additionally, data can be imported from or exported to existing HBase clusters through simple bulk ingestion tools using industry-standard formats. Low Cost: By providing a fully managed service and exceptional efficiency, Cloud Bigtable’s total cost of ownership is less than half the cost of its direct competition. Security: Cloud Bigtable is built with a replicated storage strategy, and all data is encrypted both in-flight and at rest. Simplicity: Creating or reconfiguring a Cloud Bigtable cluster is done through a simple user interface and can be completed in less than 10 seconds. As data is put into Cloud Bigtable the backing storage scales automatically, so there’s no need to do complicated estimates of capacity requirements. Maturity: Over the past 10+ years, Bigtable has driven Google’s most critical applications. In addition, the HBase API is a industry-standard interface for combined operational and analytical workloads. To help get you started quickly, we have assembled a service partner ecosystem to enable a diverse and expanding set of Cloud Bigtable use cases for our customers. Starting today, these service partners are available to help you take a new approach to data storage in your own environment. SunGard, a leading financial software and services company, can help you build a scalable, easy to manage financial data platform on Cloud Bigtable. In fact, it has already built a financial audit trail system on Cloud Bigtable which is capable of ingesting a remarkable 2.5 million trade messages per second. Pythian, a global data consulting company, has integrated OpenTSDB with Cloud Bigtable to provide a monitoring and metrics collection platform. CCRi is a contributor and supporter of the open source spatio-temporal database “GeoMesa.” By integrating GeoMesa with Cloud Bigtable, CCRi is able to provide a scalable platform for real-time geospatial analysis in the cloud. Telit Wireless Solutions, a global leader in Internet of Things (IoT) enablement, has integrated their IoT EAP (Application Enablement Platform) "m2mAIR" with Cloud Bigtable to enable a much higher performance in data ingestion. As of today, Cloud Bigtable is available as a beta release in multiple locations worldwide. We are already helping customers like Qubit migrate a multi-petabyte HBase deployment to Cloud Bigtable. We look forward to seeing what sorts of amazing, innovative applications you can create with this powerful piece of Google technology. If you have any technical questions please post them to Stack Overflow with the tag ’google-cloud-bigtable’, and if you have any feedback or feature requests please send it to the feedback list. As businesses become increasingly data-centric, and with the coming age of the Internet of Things (IoT), enterprises and data-driven organizations must become adept at efficiently deriving insights from their data. In this environment, any time spent building and managing infrastructure rather than working on applications is a lost opportunity. 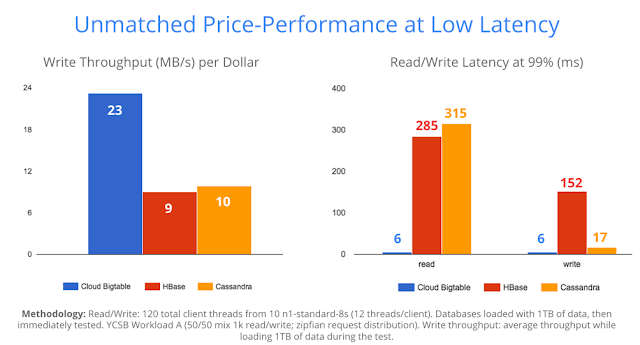 That’s why today we are excited to introduce Google Cloud Bigtable — a fully managed, high-performance, extremely scalable NoSQL database service accessible through the industry-standard, open-source Apache HBase API. Under the hood, this new service is powered by Bigtable, the same database that drives nearly all of Google’s largest applications.